There is always a sense of urgency around the holidays. It’s everywhere, and not just in the way people drive and how they crowd closer to you in the checkout line. (Personal space, people!). The urgency, it seems, is in our desire to mold the holidays into a caricature of what we think they should be. So I bought a gingerbread house kit recently. Me, who once put plastic corn husks in the garbage disposal and whose husband douses everything I make with hot sauce. Clearly, I don’t have a good command of the kitchen. Still. How hard could it be? Tyler was thrilled. What a great mother/son project. I opened the box and set before us all the house pieces, icing and candy. The icing came with dire warnings about how fast it would dry. No problem. I could be quick. I mixed it up with beaters on medium speed. So far so good. The instruction manual said the frosting should be transferred from the bowl to the plastic frosting bag, which looked like a pastry bag. I tried, but suddenly frosting was everywhere. It dripped on the sides of the bag, making it cave in around my hands. It got on the counter, the floor. “Hold the bag,” I yelled to Tyler, as I finally just tried to dump the whole bowl into the bag instead of using a spoon. “I’m trying!” he yelled back, although he was letting go to lick his fingers. By this point, half of the icing was in the sink and the other half in the bag. Tyler held together two gingerbread sides while I glued. We waited. I glued some more. “My hands are tired,” Tyler said. I pulled back the frosting bag and consulted the manual, which, by the way, should have tipped me off. Fun things typically don’t come with a manual. On Page 4, I found this: Let dry at least one hour before proceeding to the next step. Paint dries faster than that. Who’s going to hold this crappy wall in place for an hour, Norman Rockwell himself? I turned back to the cover of the manual and read: Completely read through instructions before you begin. Too late for that. I scanned the list of contents that I would need to continue: scissors, a paring knife, cornstarch, ruler, rolling pin. “Honey, I just don’t think we can do this; it’s not going to work,” I said, noticing icing had been oozing from both the top and bottom of the frosting bag while I’d been reading. There ensued a lot of violent cussing. 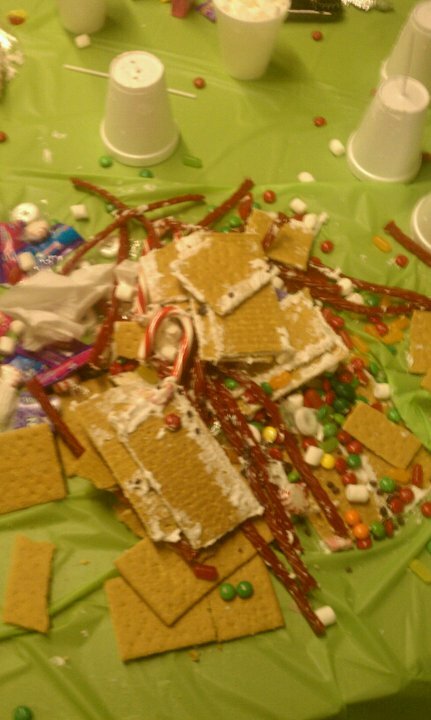 The frosting covered the candies, the gingerbread panels, the table, the floor, my dish towels and me. I finally threw the tube in the sink. “It’s OK, Mom,” Tyler said. 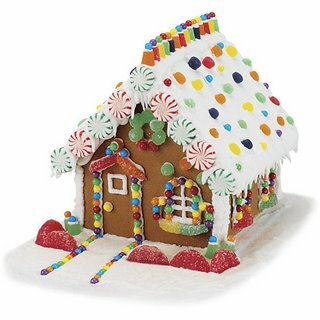 I later learned there are gingerbread kits that come with pre-made frosting and notches in the walls. You don’t even need a ruler. Who knew? I am willing to try again, but Tyler is over it. I guess the gingerbread tradition was my big thing, not his. So I’ve got an extra gingerbread house kit–sans frosting. I don’t have the heart yet to throw it away. It’s short a few gumdrops too, which I ate. Don’t I have a life?